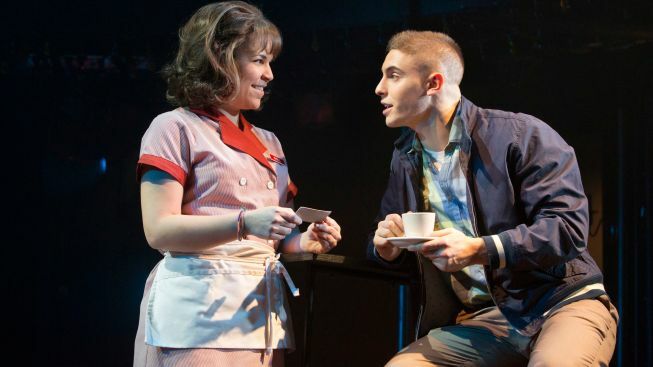 Lindsay Mendez is a first-time flirt opposite Derek Klena in "Dogfight"
When sheltered waitress Rose gets invited out by a handsome Marine, she doesn’t know she’s become a pawn in a “dogfight,” a cruel contest between three young men to see who can bring the homeliest date to a party. “Dogfight” was, first, a gem of a film from 1991, starring Lili Taylor and River Phoenix. Now, it’s been updated with a musical score by Benj Pasek and Justin Paul (they’ll shepherd “A Christmas Story!” to Broadway this winter) and given a mid-summer run at Second Stage’s Tony Kiser Theatre on West 43rd Street. At Second Stage, Lindsay Mendez (“Godspell”) is the awkward and idealistic waitress whose plain looks make her a target for the ill-intentioned Marines. Derek Klena (MCC’s recent “Carrie”) is Cpl. Eddie Birdlace, the soldier heading for Southeast Asia on the eve of JFK’s assassination who meets her at a San Francisco coffee shop. NBC 4 New York chatted with Mendez about beauty, and what it means to be cast in a starring role like this one. NBC4NY: Where does Rose fall on the scale between “insecure” and “self-possessed?" MENDEZ: I don’t think she’s a very insecure person, she’s just unfamiliar with the events of the evening. She’s never been to a party. She’s never had a date with a boy. And I think she’s experiencing all these these things for the first time and her eyes get opened. I think the evening and the story is about the loss of her innocence. NBC4NY: What do you have in common with Rose? MENDEZ: I have a lot in common with Rose. I’m a positive person, as a rule. I always seem to look for the best in people, and I have a lot of hope... The thing I lack is... she’s so brave. And I think I’m a little bit brave, but definitely not as brave as she is. This role has taught me I need to step out a little more, because I love that about her. This role seemed very easy to take on, because I’ve been through what she’s been through in so many ways, that moment of being let down and not feeling “beautiful enough,” for lack of a better phrase. MENDEZ: I think there are moments from my career, maybe a role I was afraid to go for, moments where I felt there was no way I could do certain things, because I wasn’t a strong enough musician or actor... I think going in for this show, with (director) Joe Mantello, this was the first time I had enough confidence to believe in myself. I feel a lot less afraid to go out on a limb and play an “ugly girl” and be OK with it. NBC4NY: Yeah, cool. There’s been quite a bit written about how you take inspiration from Judy Garland. MENDEZ: I was so fascinated with how beautiful she was, and what an incredible actress she was... and then I started researching more about her life and hearing about how ugly she always thought she was. She was such an insecure person, which baffled me, because she was so insanely wonderful, and she just never got it. Her story resonates with me, and I think about how unique and special she was, and that’s the kind of actor I want to be: someone you can’t find a replacement for. NBC4NY: So there’s some Judy in Rose? MENDEZ: Rose is so much about feeling. What I love about her is, she never feels sorry for herself. Because I think if she did, the audience wouldn’t be on her side. MENDEZ. Ha, ha, ha. You know the scene in “Dogfight” when Eddie asks her to play the guitar? He’s saying, “It’s just for me.” That moment would make me, Lindsay, want to die. And it kind of makes Rose want to die, too. I don’t like someone saying: “Come on, Lindsay, come over to the piano and sing for us.” That makes me want to hurl. I don’t want to be like: “Come on, everyone, listen to me and how great I sound!” There’s something very horrifying about it to me... but playing a character in the telling of a story? I’m happy to do that. NBC4NY: Certainly, performing with the jazz band calls attention to yourself. MENDEZ: Well, I’m with a band and we’re working together. It’s not like when your family is like: “Lindsay, sing for us. It’s Christmas.” That doesn’t happen, because I say no. They know better than to ask me. NBC4NY: You watched the 1991 film “Dogfight” -- not a musical -- before your audition. What did you think? MENDEZ: I thought Lili Taylor was beautiful, well-rounded and full. And I thought there were so many moments where this character should sing. I thought it was wonderful, even though the subject matter was hard to digest. NBC4NY: It is tough to think about, the cruelty. The story in the film and the new musical is pretty much the same. What’s your takeaway? MENDEZ: I think there’s the obvious one, that love and beauty is about more than what’s on the outside. But I think it also says a lot about our military and these boys who go away, and they strip everything human out of them, so they become these killing machines... and that’s why they’re able to have a dogfight. Because they don’t see people as human, emotional beings... Someone said to me the other day, Rose is a symbol of America and what America hopes to be and wants to be. She’s always fighting against the ugly and the harsh. Rose is really that innocent. I had never thought about it that way, but I like it. “Dogfight” runs through Aug. 19 at Second Stage. Ticket information is here. And there’s a charming video of Lindsay Mendez and co-star Derek Klena during the "Dogfight" rehearsal process here.